The sun rushes to the horizon when you’re lost and cold. It doesn’t hesitate. It doesn’t linger. It mocks your doubts and moves decisive and swift, falling like a shooting star. There’s a bridge somewhere in the backwater sloughs south of La Crosse. It’s close to a grocery store with shelves of fresh muffins and roasted chicken. That’s how I imagine it anyway, but I never saw it. I could only see grass, miles of it around thin tongues of water. Halfway to the bridge, the screen on my gps flickered away and went black, leaving me floating in a maze of marsh islands, blind and miles from the main channel. I knew where the channel was. I could see where it hung under the high bluffs along the western bank, but beyond the deep water, the river splits, curls, and disappears into a hundred tiny fingers, braiding itself into a thousand dead ends. I found the biggest tongue of water I could and followed it, twisting and turning, sometimes so close I thought it would break through to the channel, sometimes backwards and away until I thought it would disappear in the grass. I wanted a way back at first, then an island, then nothing more than a piece of dry dirt to camp on, but the sloughs refused to give me up. “Not yet,” they seemed to say. The water widened into a lake filled with pelicans, white against the fading light. 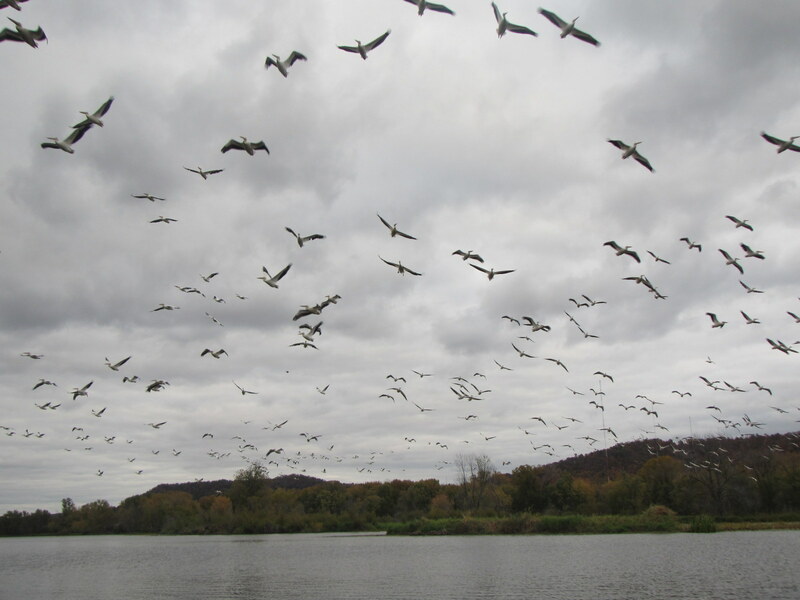 They rose into the air, hundreds of them, soaring up in giant swirls, their wings beating into the sky. I forgot about the bridge, about the river, about islands and sand beaches, and stared in awe as they turned toward me and the day shrunk into a few beautiful moments that made every other second cheap. Posted in Angle to Key WestTagged AKW October, Angle to Key West, birds, gps, mazes, migration, mississippi river, navigation, pelicans, resupplyBookmark the permalink. Oh my gosh, Daniel! I’ve never seen so many pelicans- that is amazing! For a moment, I thought I was in a Mississippi remake of The Birds.